What I didn't do was put them in the dryer. It's traumatic enough to put my handwoven fabrics into the washing machine; I just couldn't handle the possibilites of what the dyer might do to them! So they were line dried. Since I’ve not used this pattern before, I plan to work it up with some dollar fabric before I cut my handwoven. 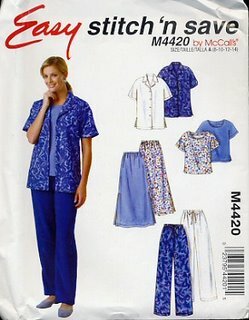 Better to find out about pattern adjustments on the inexpensive stuff! As I’ve experimented with log cabin weaving for the past two months, I’ve made some observations. 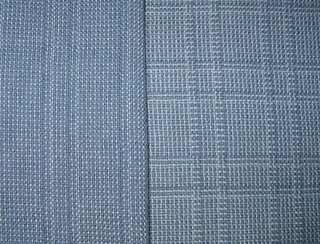 I’ve noticed two factors which influence its appearance: first, the number of warp ends in the blocks; second, the joins. 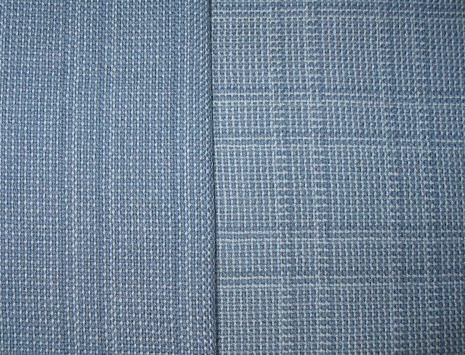 In the photo below, the sample on the left has an odd number of ends and the one on the right has even. 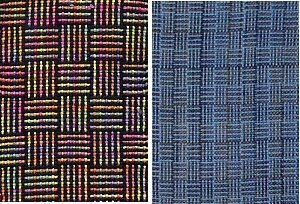 While both give the impression of being woven with striped ribbons, there is a difference in the definition of the "squares." The sample on the left is more flat looking while the one on the right almost looks as though the ribbons cast a shadow; it has a more 3-dimensional appearance. This detail could make an interesting design factor. A painter is taught that one’s eye is drawn to light and to use it to direct the viewer's attention. But in these samples, I find that my eye is drawn to the dark colors. Perhaps it’s simply because I like the pieces with the dark joins best. I think they define the “ribbons” better. Again, this is another factor I'll keep in mind the next time I weave log cabin. Beyond color, I wanted to experiment with variations in the block sizes. The result of this experiment is the yardage I’ve just taken off the loom. My inspiration for this was initially Helene Bress’s The Weaving Book page 16, then Margaret Winderknecht’s Color-and-Weave II page 77, and finally my WinWeave software (where I worked out a compromise.) More recently I’ve gotten my hands on a copy of G. H. Oelsner’s A Handbook of Weaves, and discovered some log cabin variations on pages 352 to 355. These too have piqued my curiosity. But I have problem. 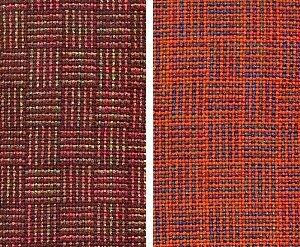 It is that whenever I weave, I constantly wonder “how would it look if I did this,” or “what would happen if I changed that.” So before one thing is off the loom, I have already planned the next 2 or 3 variations I want to try. My imagination seems to have no limit as to possibilities and I sometimes think I could spend my entire weaving life exploring one thing. But there are so many weave structures and color effects to explore that eventually I have to make myself stop and try something different. So it is now. Though I still have lots of ideas, I’m going to set log cabin aside and come back to it another day. It's time to explore something else. Very nice. And a good pattern to use for the fabric. How excited you must be! The ideas that come as you weave are a good reason for putting on, if possible, more warp than you need for the project so that when you are done weaving the project you can explore the ideas on the remaining extra. I know the tension between pursuing in depth and exploring everything. In my old age (grin!) I have come to realize the importance of exploring in depth and the creative growth that yields. And I find myself reading in all different contexts the importance of focussing and getting really good at one thing. This is how you succeed in business, it seems, and this is also how you develop "style." If you constantly jump around, you will never discover the depth of your own creative abilities. As I explore crackle, I am finding myself understanding this,though I certainly have not yet found my own style! But, I cannot totally suffocate the desire to explore so inbetween each crackle project, I plan on weaving something quite different. Perhaps you could find a similar compromise? One of the things you might find happening as you work with one weave structure is the desire to develop a workshop. I can see that possibility for myself in the future but will probably be too old to do anything with it! Give this address a try. Otherwise search Picchu Picchu by Berroco and you will find the pattern - it is a free one! Black is not easy to see when knitting or easy to photograph, but I love a nice black sweater for winter - I wear black pants and skirts often. I can use colour in blouses or t-shirts. I admire your weaving! I had written a long comment but blogger ate it. Sigh. The jist of it was that I am limited in my weaving possibilities right now by a 17" 4 harness, direct tie up loom and because of it, I have been working with mainly plain weave and simple hucks for more than 3 years. All of the interest comes from painting the warps. If you feel like exploring log cabin more, how about a painted light and solid dark, or using think and thin yarns. Think bunching and spacing. Interesting blog. I made 9x9 log cabin with doubled #5 crochet thread. Dark blue and white, it came out clear. Could one use three colors for log cabin to get blended shades? Anyone ever try that. John, I say go for it! Color experimentation is half the fun. More than half the fun!